If you prefer Gershwin, operatic arias, and pas de deux to hip-hop and R&B, chances are you didn’t make it to Bottlerock this year. Instead, you’re probably celebrating the return of Festival Napa Valley (formerly known as Festival del Sole), which is celebrating its eleventh season this summer from July 15 to 24, 2016. 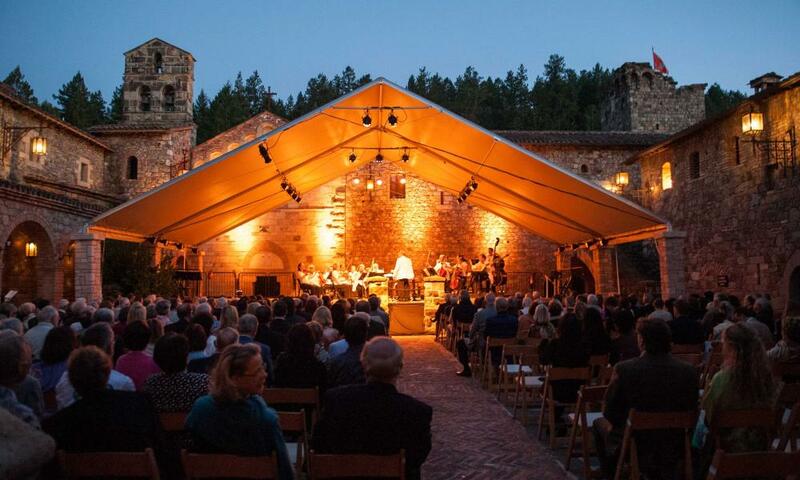 Considered one of the country’s premiere summer destination events, the ten-day fête features exclusive engagements by world-renowned classical, opera, jazz, and dance artists paired with intimate food and wine events hosted by the valley’s top vintners. Truly, it’s the Napa Valley at its glamorous best. In its week-and-a-half of spectacular performances, the festival’s most lavish evening will be Imaginarium: The Annual Festival Gala, hosted by Meadowood Napa Valley on July 17 with a tented stage on its fairway lawn. Emmy Award-winning and Grammy-nominated entertainer Wayne Brady will serve as host and emcee, and Cirque du Soleil’s acrobatic artists will entertain and interact with guests. The multicourse dinner, prepared by Meadowood’s estate chef, Alejandro Ayala, will be paired with select vintages from Bounty Hunter, Darioush, Twomey, and the Gallo Signature Series. The evening will conclude with auctioneer Fritz Hatton conducting a live auction featuring a dozen once-in-a-lifetime luxury lots. Proceeds will go to the festival’s Arts for All initiative that provides free and affordable programming along with grants to local schools and arts organizations. To date, the gala has raised more than $4 million to support Festival Napa Valley’s mission to make the arts accessible to all, becoming a leading funder of arts education in Napa County public schools and providing local residents with free and affordable access to performances of the highest international quality. Emmy and Tony Award-winning actress and singer Kristin Chenoweth opens the season with an intimate recital at Castello di Amorosa. San Francisco Ballet, accompanied by members of the San Francisco Ballet Orchestra, makes its long-anticipated Festival Napa Valley debut. An Americana program featuring Cuban pianist Aldo López Gavilán’s debut US orchestra appearance performing Gershwin’s Rhapsody in Blue, plus a special appearance by legendary soprano Kathleen Battle. Far Niente hosts a tribute evening to the season’s honoree, Margrit Mondavi, with a grand Italian feast prepared by celebrity chefs, including Lidia Bastianich, and a special performance by Dave Koz. Jazz legend Sergio Mendes celebrates 50 years of Brasil 66 at the annual “Jazz at the Castello” concert. Festival Orchestra NAPA — an all-star ensemble of principal players from the Metropolitan Opera Orchestra, New York Philharmonic, the San Francisco Symphony and other leading orchestras — makes its debut. Festival favorite Sarah Chang performs Piazzolla’s Four Seasons of Buenos Aires at the Lincoln Theater in Yountville. Renowned baritone Lester Lynch and friends perform American Spirituals at the historic Mont La Salle Chapel in a program also featuring the Young People’s Chorus of NYC. The Bouchaine Young Artist Series showcases today’s rising stars with three free concerts at the Jarvis Conservatory. Taste of Napa™ celebrates the best of Napa Valley showcasing 70 world-renowned wineries, restaurants, chefs, and food artisans. The Young People’s Chorus of New York City performs at the free Community Concert. Also appearing, for the first time, will be young dancers from the Napa Regional Dance Company. International opera stars Isabel Leonard and Michael Fabiano headline the season finale Opera Gala, conducted by Carlo Ponti. There’s a range of pass options to ensure that the entire community can experience and enjoy these live performances, from the Free Performance Pass, student rates, and $40 Under 40 ($40 passes available for festival-goers under 40) to the All-Access Festival Passport that admits you to every glittering event and grants you prime concert seating, valet parking, and concierge service. For the full schedule of events or to purchase passes, visit festivalnapavalley.org, call 888-337-6272 or visit the Festival Box Office between 10 am and 4 pm, Monday to Friday, 1850 Soscol Ave., Suite 205 in Napa, CA.